Anthony is the owner and founder of The Situate Chair Company, a business where he designs and builds Adirondack style furniture using modern materials. As an owner-artisan myself, I can appreciate Anthony’s entrepreneurial spirit and the foundational elements his company stands for: Style, Comfort and Durability. With these principals in mind, Anthony incorporates classic styling, ergonomic curves and marine grade materials into all of his products and I know Michelle is very proud of all that he has accomplished. 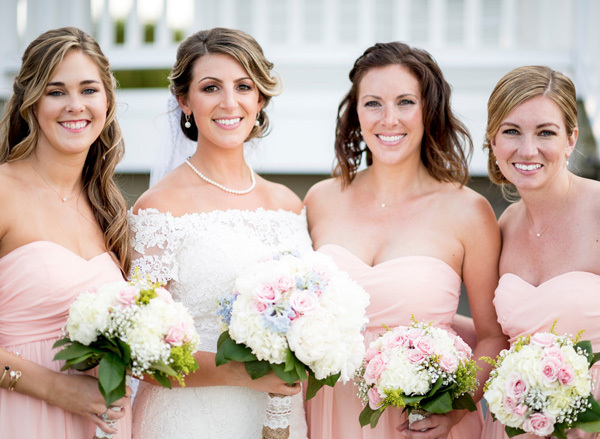 From Anthony’s Situate Chair Company to Michelle’s coastal-chic style wedding, it’s easy to see how growing up on Boston’s South Shore has instilled a similar love for the nautical New England aesthetic in both these siblings. Therefore, I thought it was an appropriate tribute to integrate the most iconic design element of an Adirondack chair into Michelle’s wedding shoes. The ivory back slats of the chair work like an art-deco style t-strap sandal, accentuated by tiny gold studs that function like bolts on a chair and surrounded by a simple blush pink structure that coordinates with the bridesmaid’s gowns. The other element of these custom wedding shoes is the lace skirt around the kitten heel. 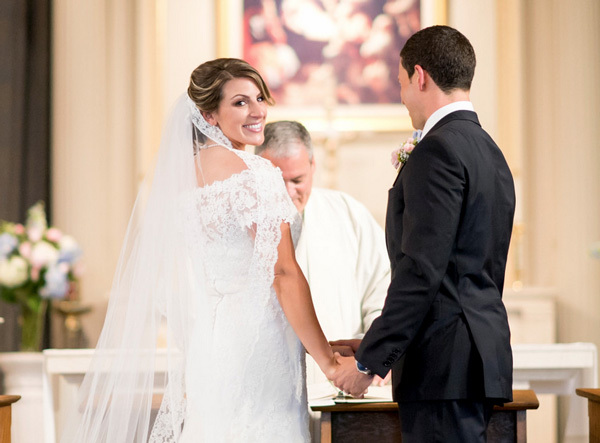 This material is the same lace as was used to create Michelle’s custom veil, thus establishing a literal coordination within her ensemble. 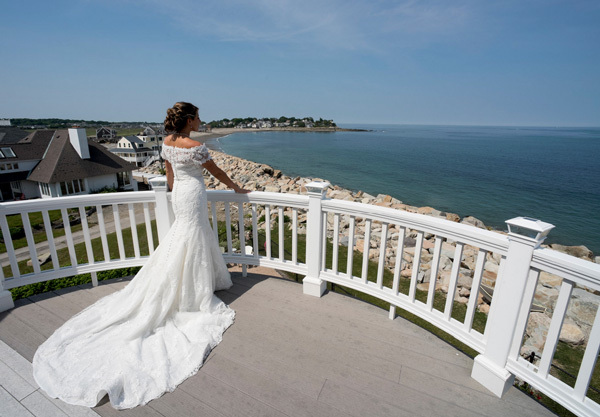 The lace brings a softer, more traditionally bridal element to the otherwise geometric upper pattern and visually creates the silhouette of a wedge, which is a common style worn around Massachusetts’s preppy beach towns. It’s necessary to note that my one regret in this design is the too-small peep-toe, which, due to the nature of the nearly pointed almond toe shape, doesn’t allow for the toes to actually peep out of the opening. 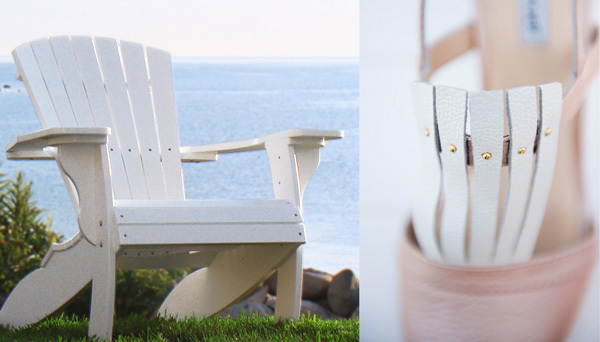 Nevertheless, just as architecture and landmarks of the coastline have inspired the Situate Chair Company, Katie Blauer custom wedding shoes are inspired by the women who wear them. In both of these cases, the outcome is a style that is a simple, yet elegant look that can be passed down from generation to generation. Michelle has already mentioned to me that she would consider passing her wedding shoes to Anthony’s girlfriend to wear in the next family wedding and it is this meaningful sentiment that makes everything I do worthwhile. See more of Michelle’s wedding shoes in the Gallery! 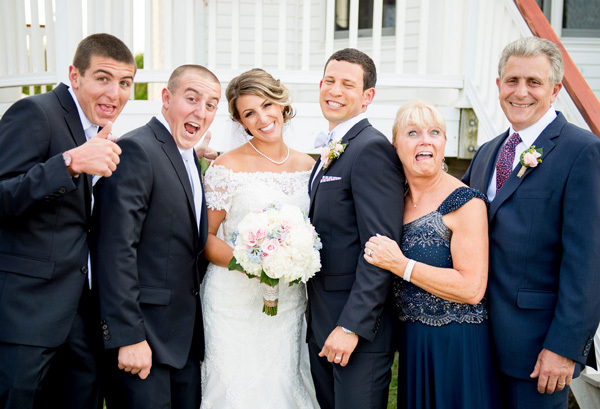 Special thanks to Scott Zuehlke Photography for sharing these beautiful wedding pictures with us. This entry was posted in gallery preview, shoes. Bookmark the permalink.